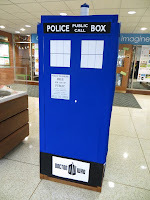 When my library decided to go with a science fiction themed summer reading program, my first thought was Doctor Who. At the time, I was in the middle of watching season 5, trying to find it in my heart to love Matt Smith when I missed David Tennant something terrible. (No worries...while David Tennant is still my favorite doctor, I grew to adore Mr. Smith and will not miss him greatly!). Luckily for me, there are several Who-vians on staff, so I had no trouble convincing them that Doctor Who Day was a brilliant idea. What else would you add? !